This Beef Short Ribs Adobo is a lip smacking, fall-off-the-bone, and tender juicy beef recipe! Some call it, twice cook adobo and others would call it “pangat”. It becomes absolutely irresistible on the third day and third time reheat. Truly mouth-watering by just the thought of it. Your family will definitely enjoy this Filipino favorite recipe. Wash the beef ribs in running water to remove blood. Drain excess water and dry it up with paper towels. Sprinkle and rub beef with salt and set it aside. In a large pot over medium to high heat. Add cooking oil and stir fry beef until ribs becomes brownish in color. Drain from oil and transfer into a platter. Using the same pot, remove the excess oil from frying the ribs. Scrape the pot with excess meat and flavors from frying the beef. Add in back the beef, pour in the water, vinegar, soy sauce, garlic and bay leaves. Cover the pot, bring it to a boil and let it cook over low heat for 2 hours or until the meat becomes very tender. Garnish with chopped spring onions (optional). You can make it spicy too, by adding chopped red chilis or chopped long green chilis (siling haba). If you want a dry adobo (or tuyong adobo), you can use about 1 ¾ cups of water instead of 2 cups water in this recipe. 1) Linisin o paraanin sa tubig ang inyong ribs upang mahugasan ang dugo ng baka. Mangyari lamang pong patuyuin upang hindi mamasa masa gamit ang paper towel. Budburan po ng asin. Itabi. 2) Sa isa pong kaldero (MEDIUM HIGH heat). Maglagay ng mantika at i-prito hanggang mag brown ang inyong ribs. Ilagay po sa isang plato kapag tapos nang iprito. 3) Tanggalin po sa kaldero ang excess na mantika. Kaskasin po ng bahagya ang kaldero upang ma deglaze or yung mga natirang lasa sa pinagprituhang ribs. 4) Ihalo po ang natiitrang sangkap katulad ng tubig, suka, toyo, bawang at dahon ng laurel. 5) Ibalik po ang ribs sa kaldero at pakuluin. 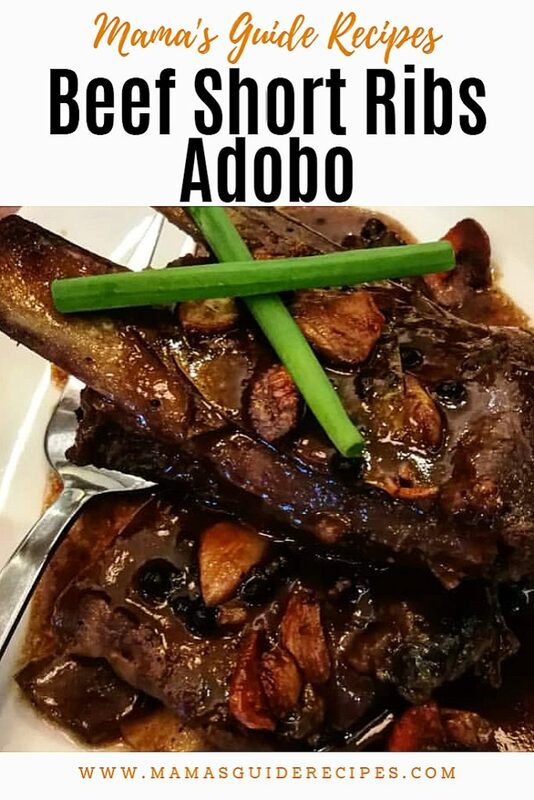 Pagktapos takpan po ang kaldero at ilagay sa mahinang apoy (LOW) at palambutin ang short rib ng mga 2 hours. 6) Kung gusto po ninyong tuyo ang adobo ninyo tanggalin ay gumamiy lamang ng 1 ¾ cups water imbes na 2 cups na nakalagay sa ingredients sa itaas. Hayaang kumulo hanggang manuyo nuyo na ang sauce nito. 7) Maari na po itong ihain at isilbi. Happy cooking!